When you Shop Small, it can lead to BIG THINGS! Support your local stores this holiday season! Shop small around town on Nov. 29th and see how American Express Card Members can get up to $30 back! 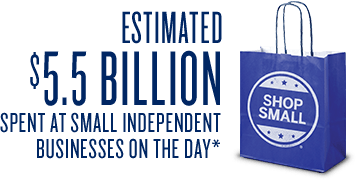 "Created by American Express in 2010, Small Business Saturday is the cornerstone of the Shop Small Movement. While Small Business Saturday is highlighted as a special day when we can show our support as a nation for small business owners and our communities, the Shop Small Movement is a year round campaign to celebrate and support small businesses every day." Find Fleet Feet Sports Annapolis | Severna Park on the SHOP SMALL MAP! Learn more about Shop Small Saturday HERE!